Heather and I went to see Pink here in Tulsa at her concert. I tell you what she can sing, and she can fly. Toward the end she got geared up and flew on wire from one end of the arena to the other. Up high in the air and cruising just over everybody’s head. She was amazing. Massed decorations in stores creep me out. 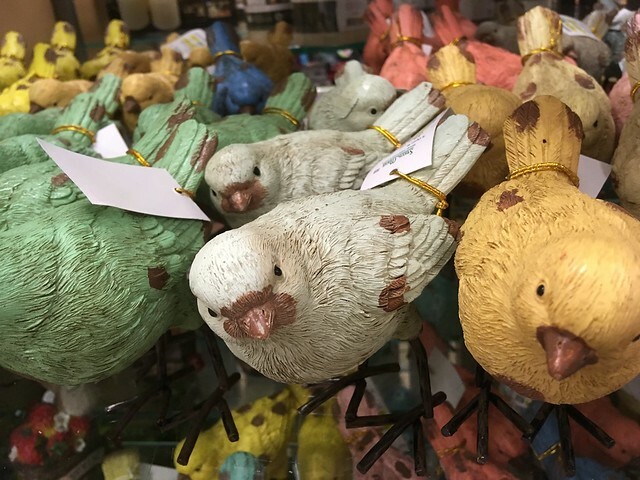 Even these birds. 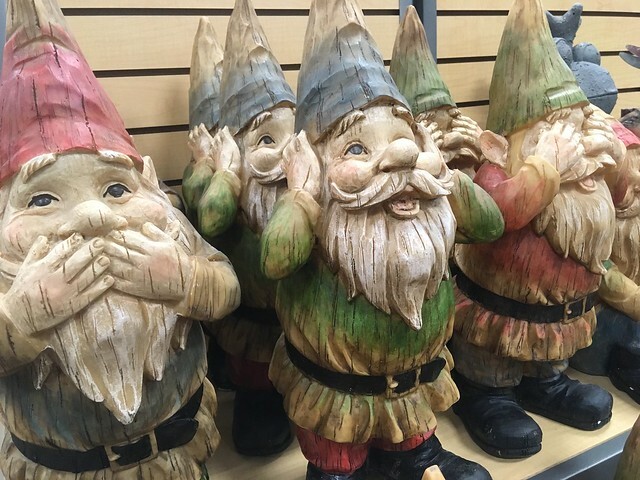 I happen to think that gnomes are evil. 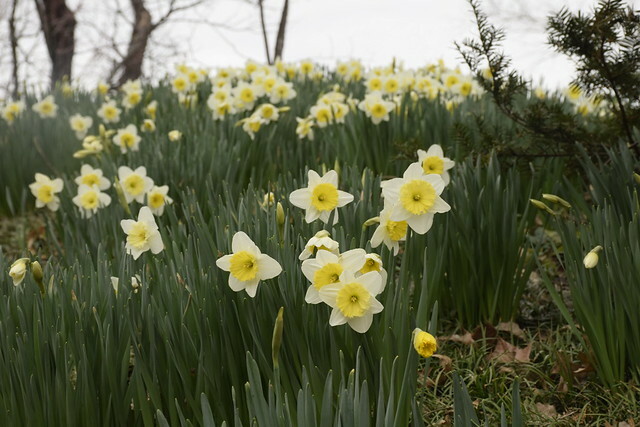 The gardens of Philbrook Museum has daffodils. I love them, especially on gloomy days. 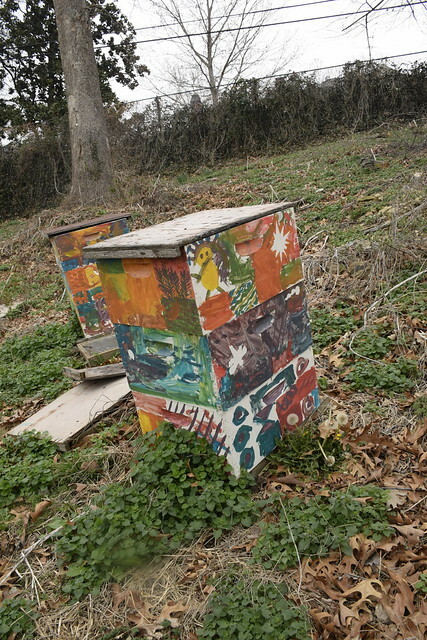 I found some artistic bee hives at Philbrook also. Gardens, no matter how fancy have those areas at the very back where they put all their left over stuff. Do you think they will reuse those hives? I hope so. My MIL, Nana, buys us a membership to Philbrook every year. I love it, I can just pop in and pop out and see what I want. I feel pretty comfortable there. They might think I am a little too comfortable. 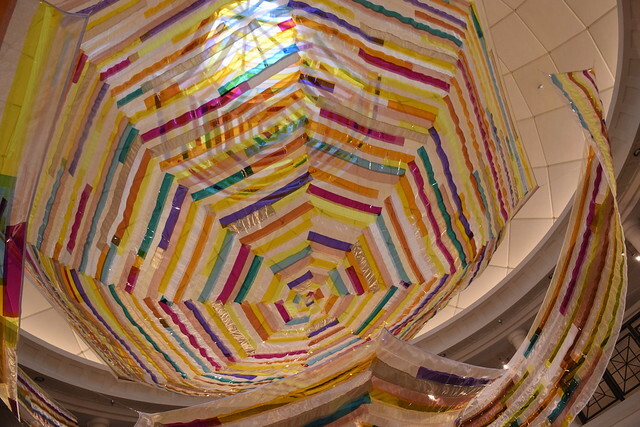 Philbrook has an “Installation” as they say by Rachel Hayes, a textile artist. The installation is spectacular but I get to thinking, what happens to the installation later? I mean do they ship it back to her, put it in their dumpsters, is it recycled? Just what or do they store it for posterity. Yes, I worry about this kind of stuff. I tell you what I think. I think they have the material returned to them, and they cut it up, and reuse it. You see I have known a few artists and they hate to throw away stuff and they will reuse what they can. Hey, I can respect that. I ventured out to Tulsa’s Graffiti “Permission Zone” at the former Mad Mike’s Liquors. The liquor store was okay with the graffiti but I wonder if a new occupant would be so welcoming. I posted a cropped version of this photo on Instagram and several people popped up and said that the female figure is an Anime figure, “Morrigan” from the Darkstalker Series. Uh? You over feel that there is a lot of stuff going on that you don’t know about. In my photography class we did light painting. 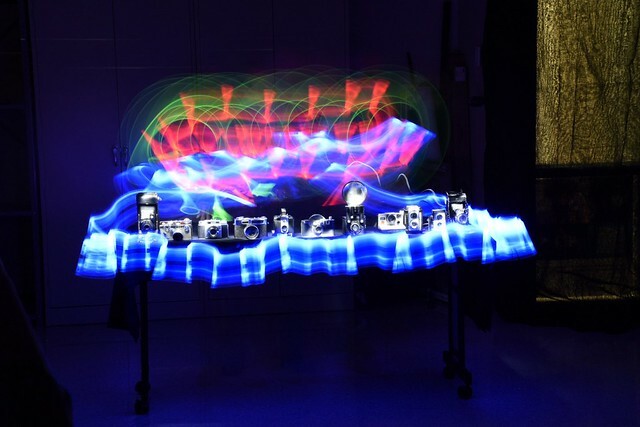 The instructor arranged all these cameras on a table in a totally dark room then illuminated them with a flashlight for 90 seconds while we held our shutters open on our tripod mounted cameras and then got colored light sticks out to create the ribbons. Totally cool! is what I thought. A couple weeks ago I walked a trail run. I have not run since November so I walked this quarter marathon. The race was in the third day of racing after several days of rain so it was muddy. 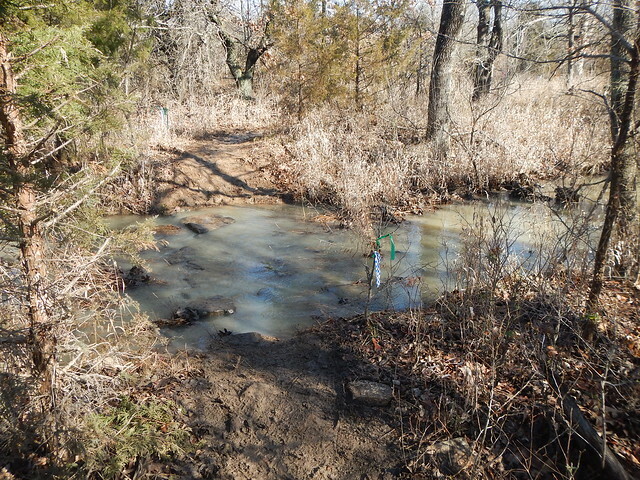 Since I was walking I tried to stay out of the mud and I was okay but there were a few places like the creek above where I just had to slog through the ice cold water. Similar thing here. 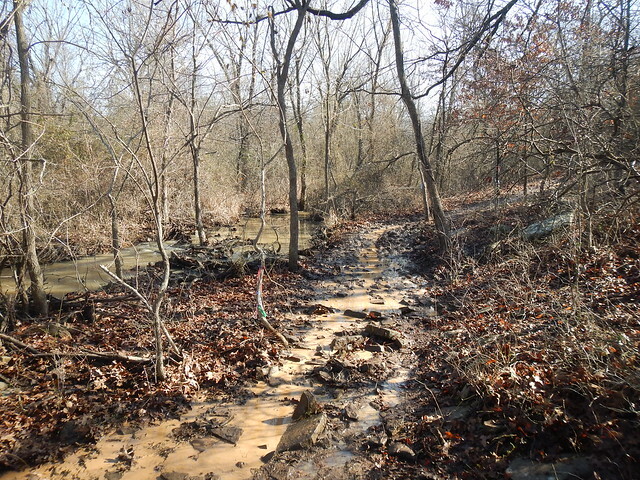 The trail, which has running water in it, is paralleling a creek. Off to the right is some pretty thick brush. Just smile and splish splash. 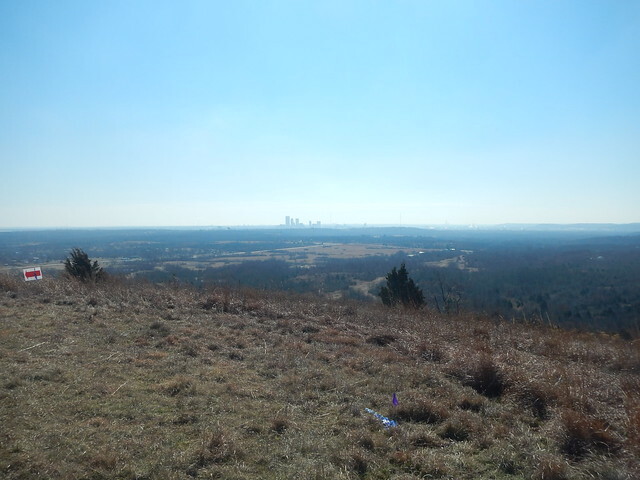 But hey, we eventually made it to the top of Holmes Peak, the tallest point in Tulsa County, big sky in all directions. 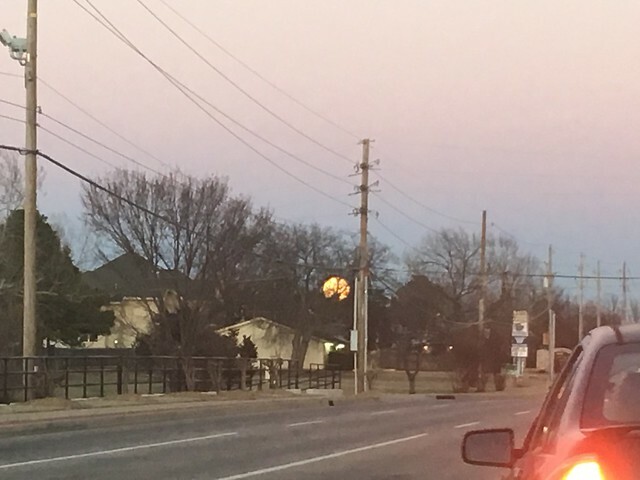 You can see the high rises of Tulsa off in the distance. I love the big skies of Oklahoma. I have to report that it took me about four hours to go the six and change miles. It was slow going!! Happy Skywatching is what I am saying this week, and linking to also. This entry was posted in Skywatch Friday and tagged Bee Hives, Decorations, Fabric Art, Gnomes, Light Painting, Mud, Philbrook Museum, Pink Concert, Skywatch Friday, Trail Runs on March 7, 2018 by Alan Bates.